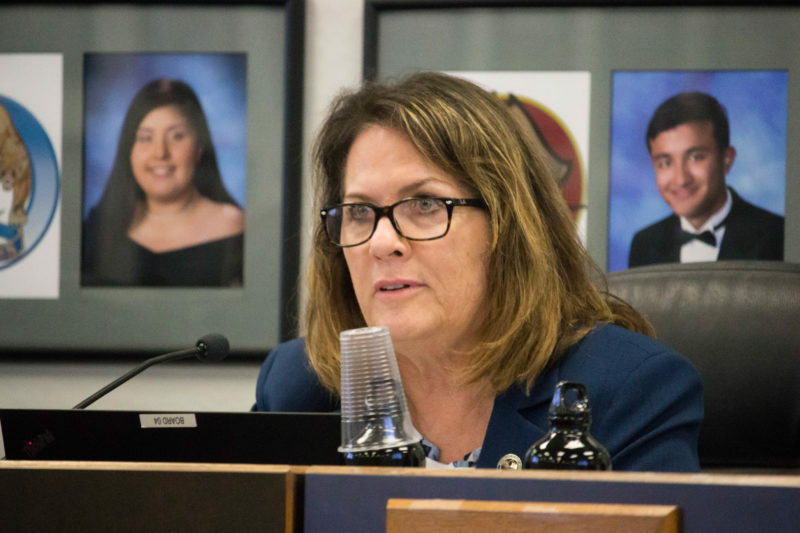 Despite the frenzy of a mid-year budget crisis, the greatest threat to the Sweetwater Union High School District still lies ahead: its growing structural debt compounded by the lack of a long-term plan to reduce spending. A new audit raises “substantial doubt” about the district’s ability to remain fiscally solvent moving forward. Say your credit card balance was $5,000 two years ago – manageable, probably. Then say it grew to $36,000 the next year – things are getting a little scary. Now assume the balance has grown to $68,000 and the payments are huge – yikes. This is exactly the situation Sweetwater Union High School District finds itself in, according to budget documents reviewed by Voice of San Diego. Only instead of thousands of dollars, it’s millions. The district’s growing debt is not happening in isolation. In recent months, officials suddenly realized they had overspent by more than $30 million in last year’s budget. That prompted an ongoing scramble to cut tens of millions from the current school year’s budget. But despite the frenzy of a mid-year budget crisis, the greatest threat to Sweetwater still lies ahead: its growing structural debt compounded by the lack of a long-term plan to reduce spending. A new audit by a private accounting firm presented to a school board committee Monday echoed similar concerns and raised “substantial doubt” about the district’s ability to remain fiscally solvent moving forward. Board President Paula Hall acknowledged after Monday’s audit and finance committee meeting the borrowing is not ideal. But given the district’s cash shortage she asked, “What else are we gonna do?” She also pledged to deal with the growing deficit in the future. Sweetwater’s ability to borrow money is the primary reason it isn’t currently in danger of being taken over by the state, as other financially troubled districts like Inglewood Unified and Oakland Unified School District have been. That ability to borrow comes from building fees, often referred to as Mello-Roos, generated on the South Bay’s east side in communities like Eastlake. Mello-Roos is a tax on new developments that is supposed to pay for additional infrastructure like schools and roads. But school districts are also allowed to borrow from these funds. State regulations require the funds be paid back by the end of the year or the next fiscal year if the money is borrowed during the last 120 days of school. It also requires the district not borrow more than 75 percent of the fund’s balance. But according to the district’s own calculations, it will break the 75 percent threshold by borrowing $93 million this fiscal year from the Mello-Roos fund, which currently sits at roughly $100 million. And the district is going into this year already owing $36 million. Because the district will also be paying money back into the fund even as it borrows, the district predicts its final loan balance to be $68 million at the end of the year. That means it will add roughly $32 million in new debt to its loan sheet this year. The district added $31 million the year before, when its balance rose from $5 million to $36 million. Such spending into the future is wildly unsustainable. This growing debt has now been singled out as a serious liability by officials at the San Diego County Office of Education as well as the auditing firm Vavrinek, Trine, Day and Company, which performed a required audit of the school’s previous year financial statement. The VTD audit also pointed to “unsustainable salary increases,” as previously reported by VOSD, as a major reason for the current predicament. Sweetwater’s board of trustees approved an across-the-board 3.75 percent raise in spring 2017. Hall, the board president, told me the board would not have given out those raises if it had better information at the time. “They were presenting it that we could afford raises at the time we gave them,” she said. Karen Michel, who served as chief financial officer at the time, played a lead role in advising the board about the raises. But she, along with Sweetwater’s finance director, retired over the summer. Weeks after they retired, Sweetwater discovered suddenly that its books were off by more than $30 million. Sweetwater’s hidden budget deficit could have inadvertently contributed to its own financial gain when it sold bonds to investors last spring. (The district may have been hit with higher interest rates on its bonds if the true extent of its finances had been known.) A credit rating agency downgraded Sweetwater’s credit rating and changed its financial outlook to “negative” after the state of the district’s books became clear. Sweetwater spokesman Manny Rubio has repeatedly said the district made its financial situation known to the County Office of Education as soon as it learned of the bookkeeping discrepancies in September. I asked Hall whether anyone should be held accountable for the financial mistakes, which could ultimately lead to tens of millions in budget cuts. If Sweetwater does fall out of compliance with the Education Code regarding its borrowing from the Mello-Roos fund, it’s unclear what would happen. County officials recently appointed a fiscal adviser to help steer Sweetwater out of its dilemma. In some cases, fiscal advisers can be given the power to overturn a local board’s decisions when the adviser believes those decisions are financially unsustainable. In its most recent negotiations with staff, Sweetwater has floated a promise not to lay off any certificated employees through the rest of the year, according to a letter obtained by Voice. Such a decision, should it be finalized, could be exactly the kind of decision county or state officials deem unsustainable. When districts run the kind of deficits currently seen in Sweetwater, they usually risk being taken over by the state. But as long as districts have money to borrow, the state won’t provide an emergency loan, which is the pre-emptor of a takeover. And Mello-Roos isn’t the only fund Sweetwater can draw from. In November, voters approved a $400 million construction bond. That money is only meant for construction and renovations. But if Sweetwater doesn’t make enough cuts to eliminate its structural deficit, that money could end papering over the district’s recent financial mistakes for years to come.